The first modification I made was to the onboard ATMega8. I added a 14.7456MHz oscillator. That increases the baud rate to 115200 and allows the SPI clock to run faster, increasing throughput. Connect ATM8 pin 7 (Vcc) to pin 14 of the osc, ATM8 pin 8 (Gnd) to pin 7 of the osc, and ATM8 pin 9 (Osc1) to pin 8 of the osc. Secure with an adhesive. (I use Permatex blue). 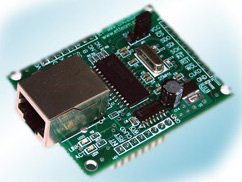 A new firmware load for the ATM8 is required and the SPI clock divisor can be decreased in the Operating System either by reprogramming the EEPROM, or just changing the value after reset. The next modification was to move the I/O page from bank 0 to bank 8. This opens the full 512k of SRAM to the system. There are some performance hits for this, as now I/O must be addressed using absolute long or long indexed modes. This requires the XC95108 to be reprogrammed and the DiskOS programs to be modified. See following modification for a link to the upgrade files. Another modification was to move the DiskOS to bank 7. Just after reset, the contents of $08000-$0FFFF are moved to $78000-$7FFFF. This opens most of bank 0 for user programs. Only $0FC00-$0FFFF are reserved for the OS. There is a performance hit for this upgrade in that calls to the OS require a JSL and RTL as well as the OS must internally adjust the direct register on entrance and exit. This change requires the DiskOS to be modified and the previous I/O move to Bank 8 modifications. This is a bug fix on the ATMega324P firmware. You will need to install the new firmware to get the CC65 library to work properly. This is not a change to hardware or firmware. Rather, it adds support for using CC65 - a 6502 C compiler. While it is not optimized for the 65816, it does support 65816 assembly. Learning how to successfully compile programs can be tricky. I am including two demo programs in the package to help demonstrate how its done. This package requires ALL of the upgrades listed above or it will not work! This upgrade adds support for an ENC28J60 Ethernet board. Drivers for it combined with Adam Dunkels' uIP TCP/IP Stack have enabled the SBC-3 to have true Ethernet and Internet connectivity. Applications include a Web Server, a simple Email-Sending application, and a Telnet Server. These are all compiled with CC65. Get the file here enceth.zip. All info provided "as-is" and is Copyright 2010 . Last updated on Nov 18, 2010.